“Fear not! 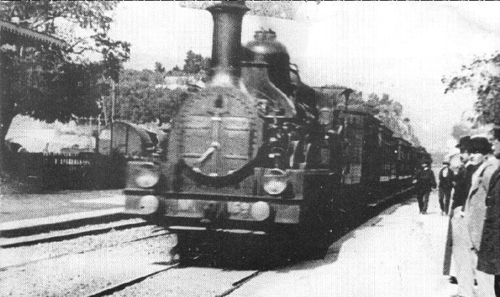 It’s only a picture of a train!” Learning the language of cinema in 1895. SPOILER ALERT! If you are like me and prefer to know as little as possible about a movie before seeing it (I don’t even like to watch trailers for this reason), then be forewarned that the following post discusses key plot elements of Christopher Nolan’s Inception. Furthermore, if you haven’t seen Inception, I recommend that you read no further and see the movie at your earliest convenience, before someone tells you all about it. Just think about how much more fun Psycho would have been if you hadn’t already known what was coming. You’ll enjoy Inception more going into it blind. A cartoon I remember from years ago depicted a couple leaving the cinema. The man opines, “I didn’t care much for the plot, but I did enjoy the illusion of motion created by the projection of still frames in rapid succession.” I still smile whenever I think of that cartoon, because not only is it funny, but it also it also says something about the way our minds are accustomed to films and television. That anyone should go to a movie and simply appreciate the technological trickery that makes our brains perceive moving images is laughable to us now. What we often do not recognize, however, is the sophistication of our collective perception, that we understand what we watch because we have learned the conventions of cinema. There is the famous apocryphal story of the audience reaction at the premiere of Auguste and Louis Lumiere’s 1895 short The Arrival of a Train at La Ciotat Station. Running only 50 seconds, the pioneering film’s documentary content is aptly summarized by its title. According to legend, viewers were so alarmed by the moving image of an approaching train and so unaccustomed to cinematic illusion that they reflexively took evasive action so as not to get run over. You can judge for yourself by viewing the original footage, which wouldn’t hold a modern audience’s attention for half its length. At the end of the 19th Century, though, content hardly mattered. Just watching projections of apparently moving images was captivating. As film viewers grew more sophisticated, so too did the medium. D.W. Griffith’s The Birth of a Nation (1915) expanded the filmmaker’s vocabulary by introducing the close-up, among other innovations. Perhaps most importantly, it also made use of parallel editing, in which two scenes of simultaneously occurring action are intercut. Griffith employed this new method to heighten the tension as a family under siege in a cabin awaits rescue. We see shots of the cabin chaos, then shots of the rescuers en route, then back to the cabin, then to the rescuers, and so forth. Its shockingly unapologetic racism aside (the attacking brutes are black, and the rescuers are the Ku Klux Klan), The Birth of a Nation nevertheless was a cinematic milestone that has influenced narrative editing to the present day. A decade later, Russian filmmaker Sergei Eisenstein made Battleship Potemkin, which pushed the editing envelope even further. Eisenstein put to work his theory of montage, by which the juxtaposition of two independent images can suggest ideas that are not inherent to either of the composite shots. In the famous Odessa Steps sequence, viewer empathy is elicited through the careful placement of close-ups showing the marching feet of an advancing army, the terrified face of a young mother, and the wheels of a baby carriage resting precariously on a step. Eisenstein also had the artistic audacity to fiddle with the nature of time, dramatizing a sailor’s rebellious smashing of the captain’s plate by repeating the motion. The Lumiere Brothers, Griffith, and Eisenstein were pioneers whose innovations rippled like expanding shockwaves through the work of succeeding generations of filmmakers. More narrative editing techniques were invented over the decades, and audiences learned how to correctly interpret them. In a medium that is now well over a hundred years old and the beneficiary of countless technical advances, we can be forgiven for assuming that the frontier of cinematic storytelling has been thoroughly settled. Yet new ways of delivering narratives keep evolving, as evidenced by last year’s Inception. A four-time Golden Globe nominee and just this week nominated for eight Academy Awards (including Best Picture and Cinematography, though curiously not Editing), Inception takes the standard technique of parallel editing and stretches it to its coherent extreme. Audiences must juggle no less than five simultaneous narratives featuring the same characters in a Russian nesting doll of dreams within dreams. That it makes any sense at all is a tribute not only to the cleverness of writer/director/producer Christopher Nolan but also to the sophistication of modern movie audiences. Nolan dares to test the patience of viewers by opening with minutes of barely understandable and seemingly unrelated developments, slowly feeds us the information we need to get our bearings, and then sets in motion a cerebral thrill ride that surely decreased popcorn sales during its theatrical run. Unlike, say, the frothy Sandra Bullock vehicle The Proposal, you wouldn’t want to dash out of the theater for a second of Inception for fear of totally losing your grip on what is happening. The heart of the movie takes place during a 10-hour plane journey from Australia to the United States. Our protagonists are a team of individuals who have mastered the art and science of shared dreaming, by which they intend to sedate a wealthy business heir and implant deep within his mind a suggestion that will benefit the heir’s chief rival, who has employed them. Soon, all of our principle characters are asleep, and we enter a dream world, which resembles a metropolitan streetscape. In this scenario, one character remains “awake”, driving the van in which the others are sedated again so as to enter a dream within a dream. All but one of the characters in this second dream jointly enter into a third dream, or a “dream within a dream within a dream.” As if that weren’t enough, several characters descend into yet another dream. Tension is ratcheted up with the idea that sleepers must awaken from from the innermost dream and then rapidly ascend each level in order to return to reality. That would have been enough for viewers to chew on, but Nolan adds another dimension to the confusion by suggesting that the brain functions more efficiently in a dream state, and thus time seems to expand in a dream. We are told that the sedative that keeps our characters asleep is so powerful that time within a dream lasts 20 times longer than reality. This effect is compounded for dreams within dreams, so a second dream will last 400 times longer than reality, a third dream will last 8,000 times longer, and existence within the fourth layer will last an astonishing 160,000 times longer than the hours during which one is actually asleep. Oh, and to put a further twist on things, the balancing mechanism of the inner ear is unaffected by the sedative, so sudden shifts in equilibrium can dramatically affect each dream layer. The coup of Inception is a magnificent sequence that occurs during a few seconds of free-fall as the van in the first dream layer plunges off a bridge and approaches the water. This translates to a couple minutes of time in the second dream, wherein the sole conscious character must contend with a sudden lack of gravity. Meanwhile, about half an hour elapses in the third dream, and nearly half a day in the fourth. Nolan constantly shifts among these four concurrent dreams in a masterful display of parallel editing. Inception is not flawless. Some of the plot developments occur a little too conveniently, arriving in such a way that our heroes have precisely what they need at the required moment. It’s also a stretch for us to believe that the Japanese businessman has enough clout to make the murder charge against DeCaprio simply disappear. Then again, this is a movie in which we swallow the premise that a mysterious silver briefcase and a few yards of intravenous cabling can allow people to enter one another’s dreams. We do so at the outset, and because the remainder of the film is such an enjoyable mental workout, it simply doesn’t matter much whenever it falls short. Therefore, I commend Inception to your viewing. If you like it, think about how far we’ve come since a simple, two-location, parallel edit was considered an innovation. Celebrate the fact that our minds can create and consume something that is so wildly different from our everyday reality. And if you don’t like it, well…you can at least enjoy the illusion of motion created by the projection of still frames in rapid succession.